Letter from Isaac about dearth of childhood photos. Too much to tell. Read the books! 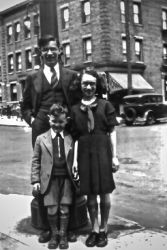 He arrived in the U.S. with his parents and younger sister, Marcia, in Feb. 1923 when he was about 3 years old. The USS Baltic departed from Liverpool and landed at Ellis Island. Although his father's written recollections say they arrived on Feb 3 and were allowed to leave the ship on Feb 7, the records from ellisisland.org, which has the original ship's manifest, say they arrived on Feb. 13, 1923. 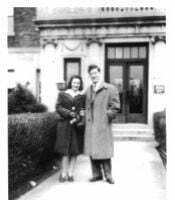 "I was very young when I started to like to talk to her (Anna), but she used to dress up and go away with or to girl friends, giving me the impression that she doesn't care for me, until a little over 50 years ago we got married. "That was right after the Communist revolution. But regardless, we had a truly Jewish wedding, where the whole town's people Jew and Gentile came to the front of the shul where our wedding took place under the open sky." Judah's niece, Serafima Asimova, later wrote an email to her cousins in the United States dispelling a rumor in Petrovichi that Judah and Anna left for the U.S. because the Bermans and Asimovs were not happy about the marriage. (Note: Serafima refers to Anna as Hanna, and to Judah's mother as Hanna, as well) The rumor was "...that Judah and Hanna Berman there have left far away from my grandmother Hanna which did not like the wife of the son. It is a lie." 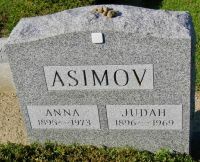 She writes: "Judah - the first-born Hanna and Aaron Asimov. 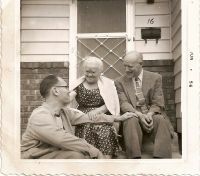 The grandmother of Hanna (Berman) very much liked Judah. When he began to meet about Hanna Berman, the grandmother asked the son to not hurry up. He was high and beautiful, and Hanna very small. But to a place there has come a typhus and Judah was ill the Typhus. For days and nights stayed about his bed of Hanna Berman and heart of the grandmother at a kind of such love and fidelity has trembled and she has recognized to Hanna and was glad to their marriage." 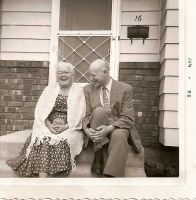 Gertrude & Isaac Asimov early 1940s? [S259] Isaac Asimov in "In Memory Yet Green" 1979. 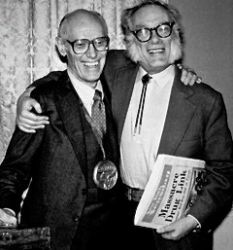 [S166] Isaac Asimov in "In Memory Yet Green" (1979), Isaac's father, Judah "Jack" Asimov. [S29] Biography & Genealogy Master Index (BGMI), Ancestry.com. Biography & Genealogy Master Index [database online]. Provo, UT: MyFamily.com, Inc, 2005. Gale Research Company. Biography and Genealogy Master Index. Detroit: Gale Research Co., 2005. 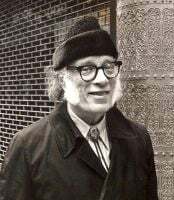 [S74] Judah Asimov's written recollections (1969).